Well, someone asked me few hours ago, “can I create Jamb 2018 profile now or I should wait for Jamb 2018 to come closer?” We shall look into that. I feel it is high time I addressed issues regarding Jamb 2018 profile creation; such as the best practices and the mistakes to avoid. I am sure you already know that every registration and examination result for 2018 will only be done at Jamb approved CBT Centres and via your Jamb account/profile? Now back to the question, should I create Jamb 2018 profile now or wait for later/next year? It all depends on you. You can create your Jamb 2018 profile now and you will still be able to use it for Jamb 2018 registration. On the other hand, if you wish to wait a little, then you are still good to go. 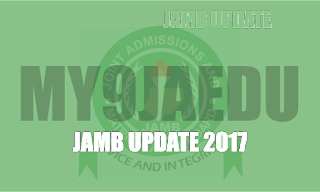 Another question: Can I use my Jamb 2017 profile for this year’s/2018 Jamb? Yes! You are free to use it unless Jamb states otherwise (which I am sure they won’t). I will update a simple guide on how to create the jamb profile soon. BOOKMARK This page and continue checking www.My9jaedu.com for likely updates.